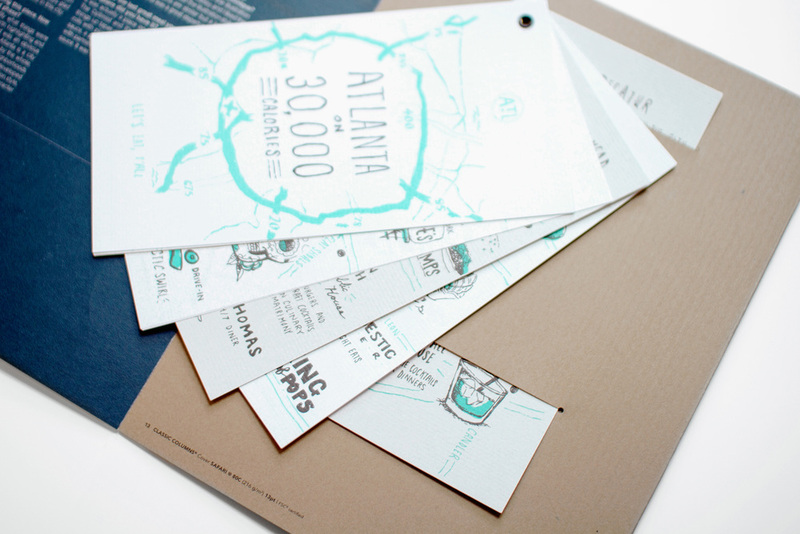 Russell Shaw's Atlanta on 30,000 Calories: An illustrated food guide and neighborhood tour for a week in the Big Peach. About Future Classic: Neenah Paper partnered with Design Army to create the Future Classic promotion – a printed book aimed at honoring the remarkable relationship between destination and design. Neenah and Design Army sought out the next class of great design cities, and the innovators who are making their marks there. They selected six up-and-coming cities and seven emerging designers. About The Project: As the emerging designer chosen to represent Atlanta and the Southeast, I created an illustrated food and drink guide to my city. Food is a rallying point for a region. Certain flavors and ways of cooking develop and become specific to certain areas. Over time, they become markers of people from a similar area. I think this is very true of the South; we've developed a rich culture around Southern foods — from shrimp and grits, collards and down-home barbecue to New American-style high-end burgers and bourbon-based cocktails. Plus, I believe there is something special that happens when you sit down around a table to a meal with others. Atlanta has developed its own unique twist on Southern cooking, and I'm always glad when I get to sit around a table with friends in this city. The illustrated food guide was done in my loose, pen-and-ink style of drawing which I felt represented the folk-arty imperfection and quality of our Southern-gothic yet modern vibe. It was produced on an eight-page flyout that works as an insert that is removable from the spread of the book. Emerging Designers: Emily Brown (Portland), Faun Chapin and Meg Paradise (Oakland), Jay Fleck (Chicago), Sarah Jacoby (Philadelphia), Kate Zaremba (Washington), Russell Shaw (Atlanta). Read more about the book on Neenah's blog, Against The Grain. Or, read more detailed interviews on PRINT Magazine's post about the project. See the process shots each artist posted on Instagram at #CLASSICNEENAH. To get your very own copy of Future Classic, contact your local merchant or Neenah sales representative.